The Geological Survey of Canada publishes George Dawson’s geological map of the Canadian Rockies. 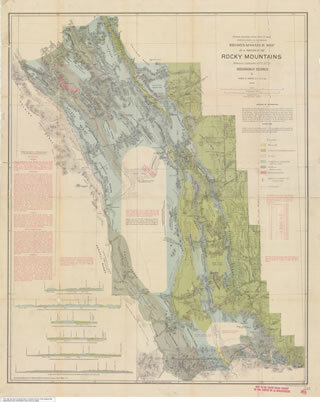 The map covers the Canadian Rockies from the border with the United States to the Red Deer Valley in central Alberta and includes Turner Valley and Bow Valley and was an important resource for natural resource exploration. William Stewart Herron, shown here ca. 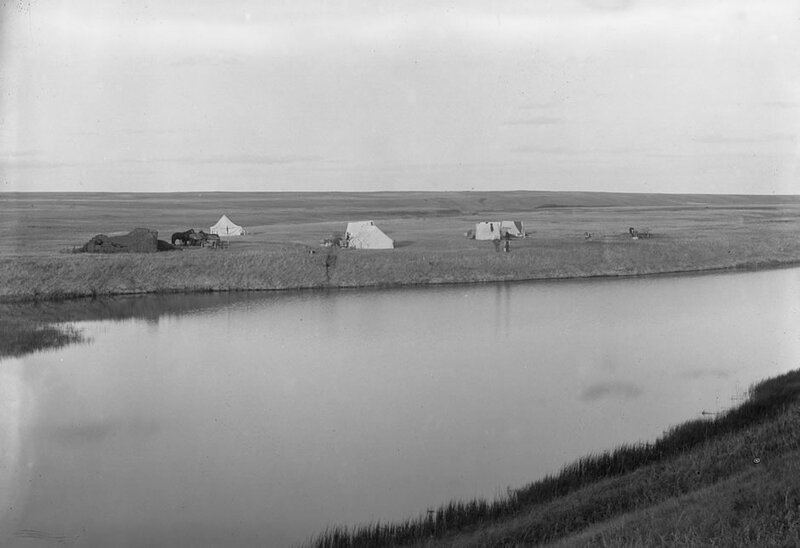 1930, noticed gas seepages along the Sheep River and acquired land and drilling rights for the area. 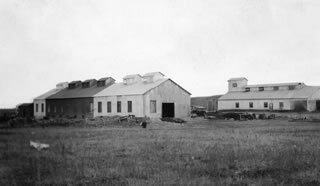 He partnered with Archibald W. Dingman and a group of Calgary-area investors to form Calgary Petroleum Products and began drilling in Turner Valley in 1913. Calgary Petroleum Products discovers wet gas at the Dingman No. 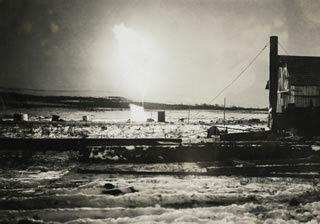 1 well on the Sheep River in Turner Valley on May 14, 1914. 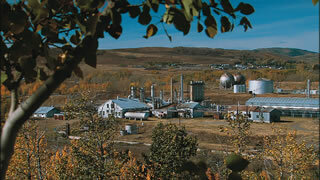 Calgary Petroleum Products begins installing equipment to process the raw petroleum. 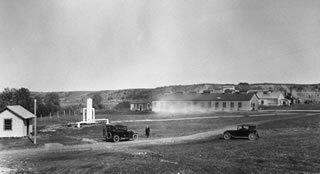 A fire and explosion in October 1920 severely damage the Calgary Petroleum Products plant at Turner Valley. 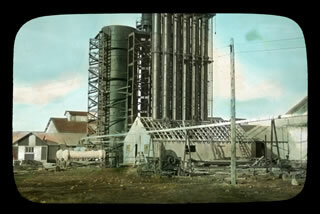 Unable to continue operations, the company is taken over by Imperial Oil in 1921. Imperial Oil forms a subsidiary company called Royalite to manage the plant and wells in the valley. New absorption and compression plants are built as well as a pipeline to Okotoks, which, on December 31, feeds gas into the Canadian Western Natural Gas line to Calgary. To meet growing consumer demand for natural gas in Calgary, Royalite doubles the size of its compression plant at the Turner Valley gas plant. Royalite No. 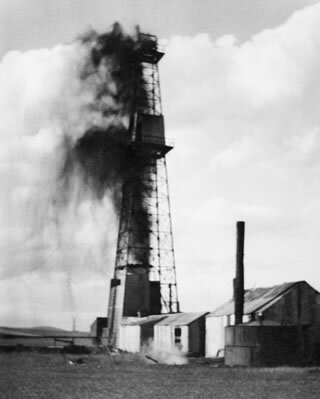 4 in Turner Valley, a sour gas well, results in a major blowout that destroys the derrick. The fire burns for three weeks until a team of experts from Oklahoma uses dynamite and steam to extinguish the flames. 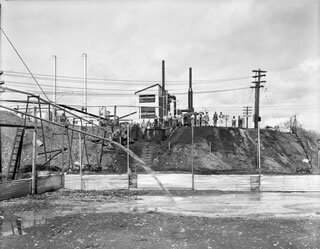 Royalite builds a new scrubbing plant using the Seaboard soda ash process to remove toxic hydrogen sulfide and “sweeten” the sour gas. This signals the beginning of a major expansion of the Turner Valley gas plant. 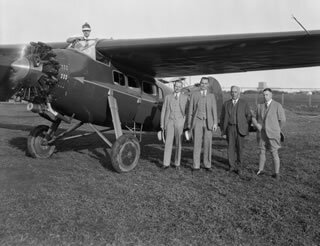 In August 1929, the Rutledge Air begins a daily route between Turner Valley and Calgary, making Turner Valley one of the first communities in Alberta to be served by scheduled flights. Flights to Edmonton commence soon after. 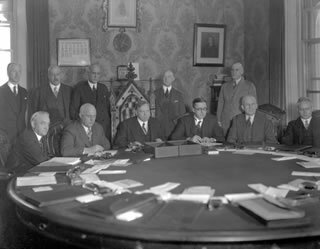 The Government of Canada transfers control of natural resources to the Government of Alberta The agreement is signed on December 14, 1929 by Prime Minister Mackenzie King (seated centre) and John Brownlee, premier of Alberta to his left. The required legislation is passed in 1930. Turner Valley and Black Diamond incorporate as villages. Hit hard by the Great Depression, both villages would be bankrupt by the end of 1931. Royalite adds new facilities and expands production capability. Turner Valley Royalties strikes oil at its No. 1 well near Longview. Although not directly related to the gas plant, this discovery sparks an economic recovery and leads to the growth of communities in the region. After years of concerns about flaring waste gas, the Government of Alberta enacts the Oil and Gas Resources Conservation Act. This Act results in the creation of the Petroleum and Natural Gas Conservation Board, which is endowed with the authority to regulate all gas and oil operations and to enforce better conservation measures. During the Second World War, the Government of Canada establishes the Department of Munitions and Supply under the control of Minister C. D. Howe. 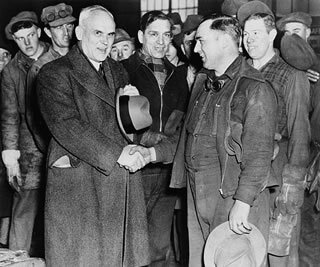 Howe and his ministry, which oversees all aspects of Canada’s wartime production, deem oil to be a strategic wartime commodity. Royalite installs a Girbotol natural gas sweetener, which allows for the increased production of natural gas. 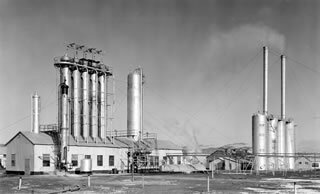 This helps meet the increased demand for natural gas during the Second World War, particularly for the Allied War Supplies Corporation facilities south of Calgary. Two Horton Spheres are installed at the Turner Valley plant to store isobutane, a necessary ingredient in the manufacture of high-octane aviation fuel. 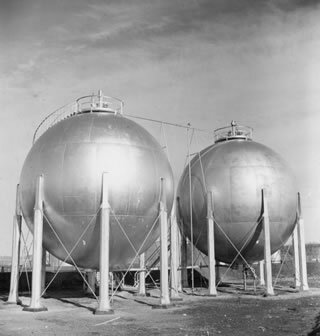 The spherical shape of these tanks is best for storing high-pressure, volatile petroleum products like isobutane. Royalite creates a subsidiary, Madison Natural Gas, to gather and process gas from wells in the Turner Valley region. 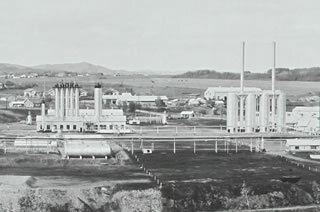 In July 1952, Royalite buys the Western Propane plant and relocates it to the Turner Valley plant site. It makes propane from the main plant’s flare gas. Madison Natural Gas establishes a sulfur extraction plant at its Turner Valley operation. This makes Canada the largest worldwide exporter of elemental sulfur. 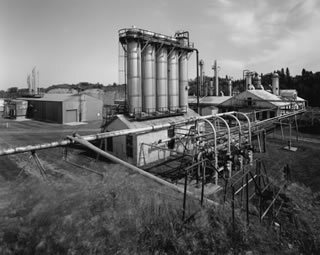 In 1985, following years of declining production and rising costs for maintenance and upgrading, the Turner Valley gas plant is deemed to be no longer economically viable and is decommissioned. 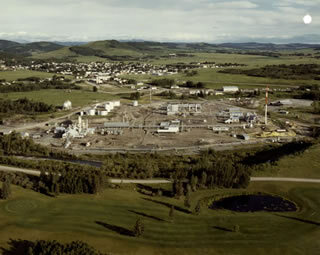 The Government of Alberta acquires the Turner Valley gas plant in 1988. 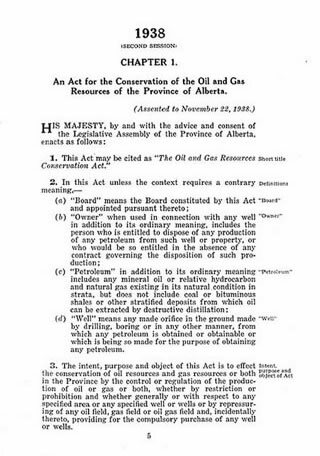 The site is determined to be provincially significant for its association with Alberta’s oil and gas history, and it is designated a Provincial Historic Resource in 1989. 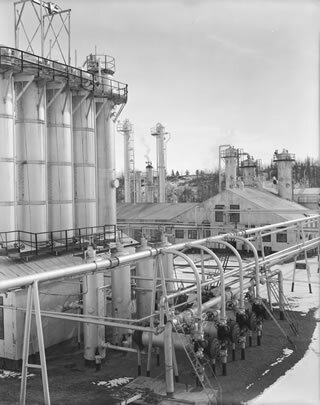 The Turner Valley gas plant is determined to be significant for its role in the development of Canada’s oil and gas industry and is declared to be a National Historic Site of Canada on November 24, 1995. 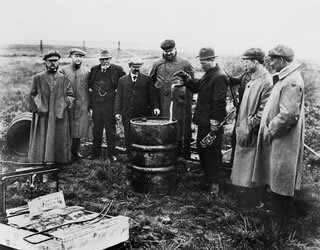 The centennial of the discovery of the Turner Valley oilfield is observed on May 12, 2014, with a public event at the site. Oil and gas exist deep within the Earth’s crust, usually with no clear signs of their presence showing at the surface. 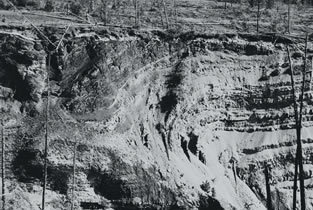 While amateur observations and sheer luck will occasionally result in oil and gas discoveries, geological surveying and mapping are necessary to develop an understanding of a region’s physical composition, to determine the likely presence of oil and gas and to choose the best possible drillings sites. 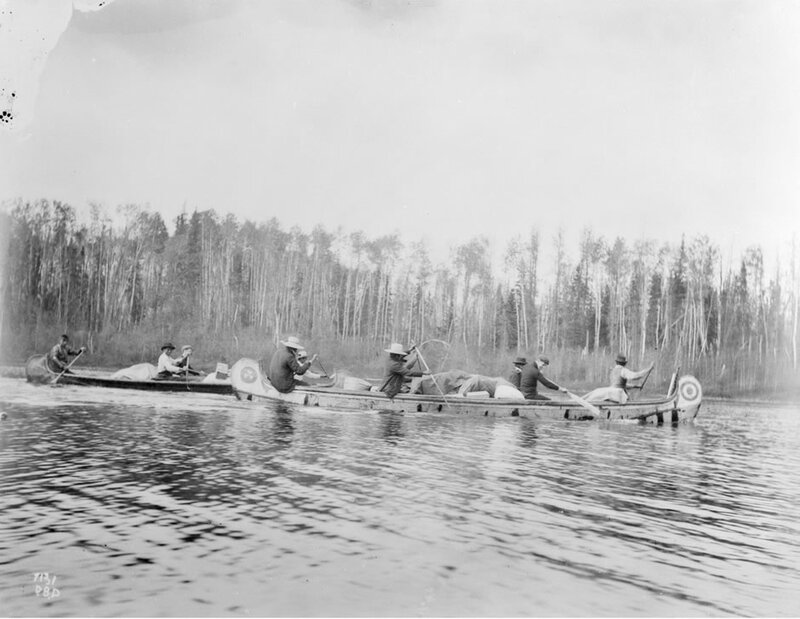 Much of this surveying work in western Canada was initially done by the surveyors of the Geological Survey of Canada (GSC), who travelled across western Canada by horseback, on foot and by canoe. 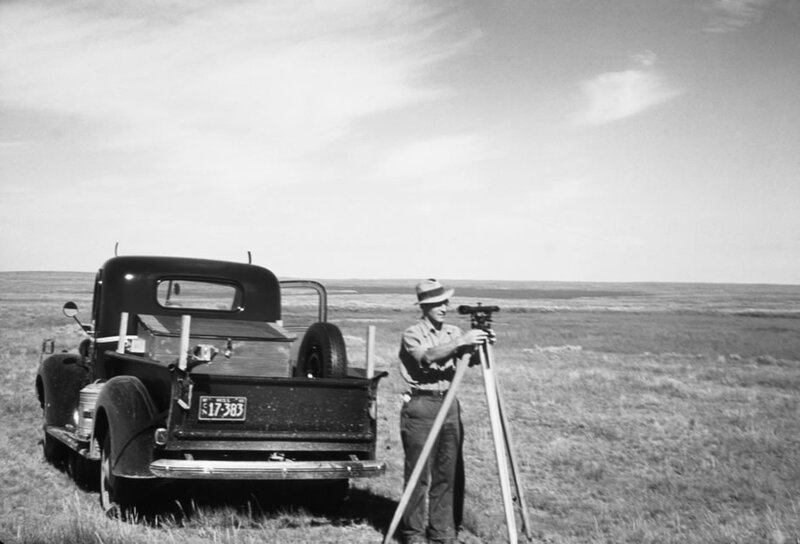 These surveyors, notably George Mercer Dawson and Donaldson Bogart Dowling, conducted landmark surveys of southern Alberta’s landscape and published important maps and reports on the region’s natural resources. 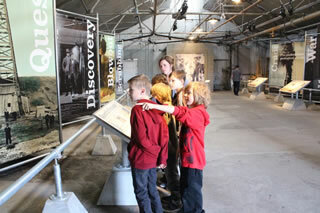 developing the province’s natural resources. The work of Tory and Allan led to the creation of the Scientific and Industrial Research Council of Alberta as well as the Geological Survey of Alberta. 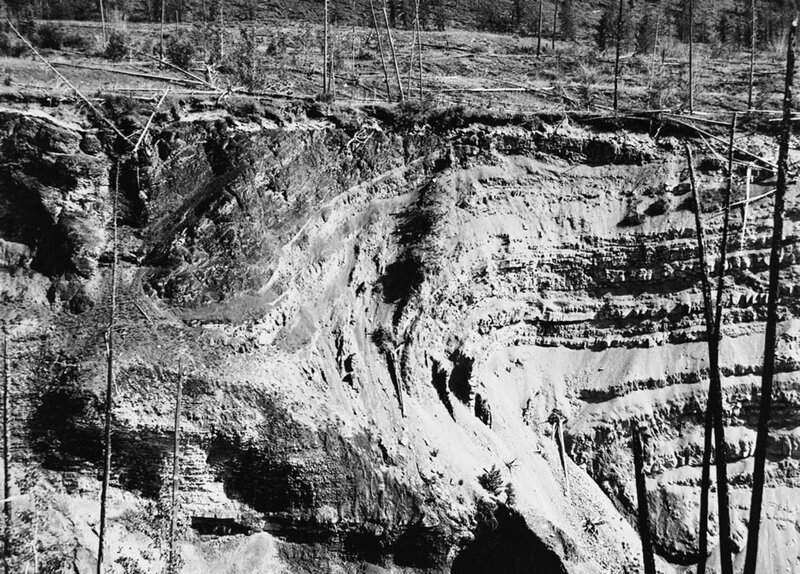 The work of these professional and academic geologists helped to develop a better understanding of Alberta’s geological make-up and of the natural resource potential of Turner Valley. 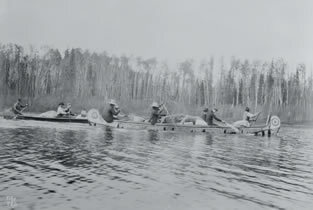 It also gave the Government of Alberta the technical expertise necessary to play an active role in developing the province’s natural resources. The oil and gas companies drilling in Turner Valley began to see the need for doing their own geological research and mapping. Searching for oil and gas and drilling wells are time-consuming and expensive operations. 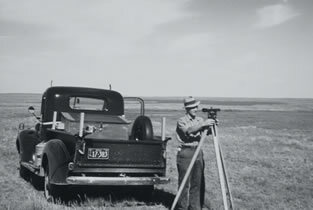 As oil companies, notably Royalite, became more sophisticated throughout the 1920s and 1930s, they began to establish their own surveying operations and employed geologists to map Alberta’s resources and determine where to drill the next wells. 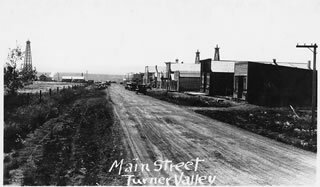 Field research by government, academics and private companies all contributed to the growing knowledge of Turner Valley and its resources. This 1937 article from the Imperial Oil Review provides a comprehensive view of Turner Valley as revealed by the geological surveying work being done in the search for oil and gas in the region. Source: “A Complicated Structure,” Imperial Oil Review, June-July 1937, 27-29 and 38. 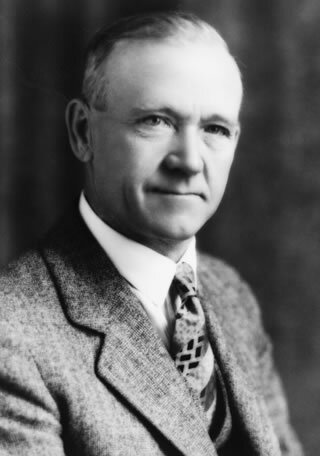 George Mercer Dawson was amongst the first people to realize the likelihood of natural gas and oil in Turner Valley. Donaldson Bogart Dowling was one of Canada’s earliest geologists and produced research on the Turner Valley field in 1914. John Andrew Allan mapped the geology of Alberta, helping to build knowledge of Alberta’s geology and mineral resources.